Think of Liverpool and you immediately think of The Beatles, Liverpool Football Club, and their famous Anfield stadium (one of the country's largest), and, of course, that unique Scouse accent. The heart of Merseyside lies on the east bank of the Mersey estuary, just three miles from the sea. At this point, the Mersey is almost a mile wide, opening out inland into a three-mile-wide basin. This is one of the reasons Liverpool, with one of the largest harbors in the world not dependent on tides, remains a major port for transatlantic shipping. The origin of the city's name first appeared in 1173 in a charter granted by Henry II and is traditionally connected with the mythological Liver Bird (pronounced "lyver"), a seagull-like bird seen in the city's coat of arms. These days, Liverpool is an important trading metropolis, university town, and financial center, as well as a key city for the Catholic and Anglican churches, both of which have bishops here. The city also has many handsome historic buildings as well as numerous gardens and parks, museums, and recreational facilities. Some of the main attractions are the Walker Art Gallery and the Philharmonic Hall, the latter regarded as one of the best concert halls in Europe. 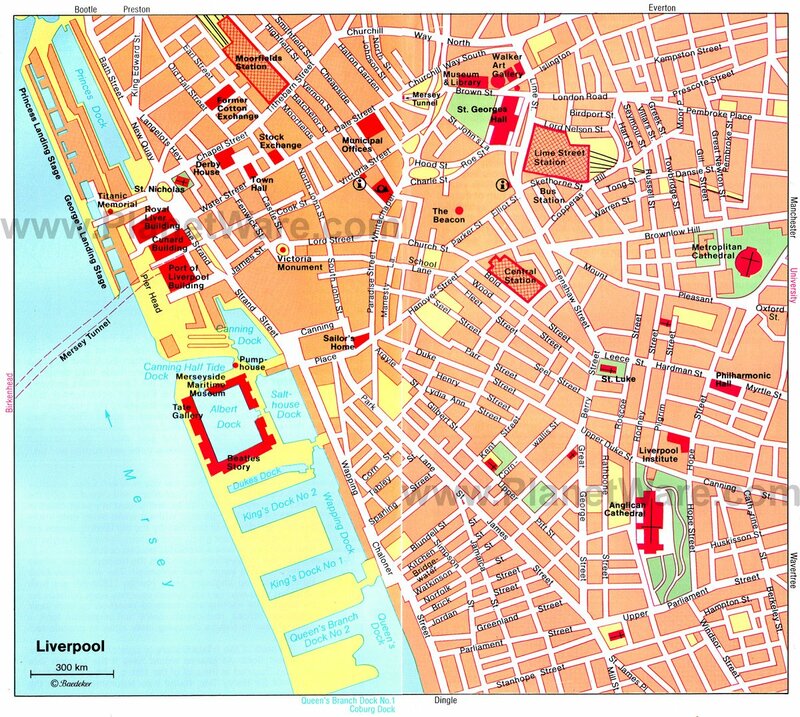 Liverpool also has the distinction of being named a UNESCO World Heritage Site, a designation that covers six locations in the center of Liverpool including Pier Head, Albert Dock, and William Brown Street. The city is also a popular shopping destination, particularly around trendy Liverpool One, a 42-acre site dedicated to serious retail therapy. 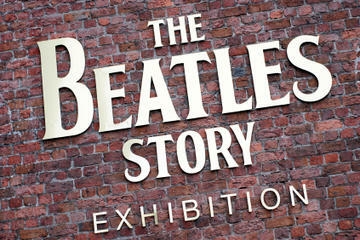 Liverpool is famous as the birthplace of The Beatles. Various tours offer fans the opportunity to follow in their footsteps (Penny Lane, Strawberry Fields) and usually include The Beatles Story in Albert Dock and the rebuilt Cavern Club, where they made their debut in 1961. Other Beatles related sites include the Cavern Walks (murals by Cynthia Lennon); The Beatles Shop; and 20 Forthlin Road, McCartney's former home, where the band wrote and rehearsed many of their early songs (the property is open to the public and features Beatles memorabilia and photos). Also of interest to fans are John Lennon's childhood home at 251 Menlove Avenue, along with the Casbah Coffee Club in West Derby. Opened in 1959 by the parents of Pete Best, the Beatles' first drummer, as a venue for upcoming local bands, the Casbah became a regular haunt of the Fab Four and remains much as it was in its heyday. The superbly restored Albert Dock, the first such facility in Britain to be built using only bricks and iron, is an impressive five-story-high block of buildings surrounding the harbor basin where cotton, tobacco, and sugar were once unloaded. These enormous Victorian structures are built around an arcaded walkway, their cast Tuscan columns once serving as capstans for moored ships. The decoratively restored warehouses with their luxury apartments, designer boutiques, restaurants, cafés, and museums are a prime example of "gentrification," a phenomena which can also be witnessed in London, Manchester and Glasgow, whereby once decaying inner cities are restored to provide recreational amenities. Albert Dock is also home to a number of first-rate tourist attractions including The Beatles Story Museum with its memorabilia, photographs, and films of the Fab Four; the International Slavery Museum, just yards from the dry docks where 18th-century slave ships were repaired and fitted; and the Border Force National Museum, which tells the story of smuggling and contraband from the 1700s to the present day. An acclaimed branch of the Tate Gallery has been established in the Albert Dock. As chance would have it, the London Tate Gallery - established at the end of the 19th century with a legacy from the sugar magnate Sir Henry Tate - found space in the warehouses where raw sugar was stored before being refined. The ground floor of the "Tate of the North" has exhibition halls and galleries dedicated to contemporary art as well as works on loan from the London gallery. Art lovers should also check out The Victoria Gallery and Museum. In a spectacular red-brick building at the University of Liverpool, the museum includes large collections of sculptures and ceramics, along with an impressive array of paintings by the likes of Lucian Freud and J. M. W. Turner. The facility also boasts a program of educational lectures and workshops, as well as a café and shop. The Maritime Museum in Liverpool is home to numerous fascinating exhibitions about the many thousands of emigrants who left Britain via the Mersey for North America between 1830 and 1930. The museum also boasts an impressive collection of artifacts related to seafaring in Liverpool, stretching back in time as far as its establishment as a fishing port in the 13th century. This rich history is illustrated with model ships, workshops, and historic vessels. Equally fascinating are exhibits relating to the stories of the Titanic and Lusitania, two of the most famous - and tragic - passenger vessels in history (each had strong links with Liverpool). Other popular things to do include visiting the nearby U-boat Story, which depicts life aboard a submarine during wartime, and the impressive Commander-in-Chief, Western Approaches museum, with its original map rooms and displays relating to the Royal Navy in WWII. The Pier Head area of Liverpool includes the traditional trio of harbor buildings known as the Three Graces: the Port of Liverpool Building, the Cunard Building (named after Canadian Samuel Cunard, owner of the first shipping line from Liverpool-Halifax-Boston), and the Royal Liver Building (not open to the public). It's also where you'll find the Titanic Memorial commemorating the "Heroes in the Engine Room" on the luxury liner that sank in 1912; the Queen Victoria Monument; and the Georgian Town Hall, built in 1754 with its lovely copper cupola crowned by a statue of Minerva. The façade of St. George's Hall on Brown Street is festooned with Corinthian columns and statues. Its sumptuously decorated Great Hall, boasting one of the world's largest organs, is often used for concerts, while to the rear of the building, the splendid St. John's Gardens feature statues of prominent Liverpudlians. The nearby Polytechnic Building is part of an imposing group of neo-Greek buildings that include the William Brown Library, the Picton Reading Rooms, and the Hornby Library. Also of interest is the impressive Bluecoat Chambers, built as a charitable school in 1717 and the city center's oldest building. Somewhat newer (it was built in 1969) but worth a visit is Radio City Tower, an observation tower that offers superb views over the city. The Walker Art Gallery boasts a rich collection of works by Italian, Flemish, and French masters from the 14th century to the present, including masterpieces by Rubens, Rembrandt, and Rodin. Its display of English painting and sculpture, particularly of the 18th to 20th centuries, is unrivaled outside London and features works by Gainsborough, Hogarth, and Moore. Of particular note is the poignant farewell scene at Liverpool's Pier Head, as depicted by John J. Lee, entitled Sweethearts and Wives. The John and Peter Moore Exhibition, an important display of contemporary British art, is held every alternate year. Associated with the Walker Art Gallery, Sudley House is an early 19th-century mansion on Mossley Hill and is home to a gallery containing artists such as Gainsborough and Turner. The Catholic Liverpool Metropolitan Cathedral reflects the high proportion of Liverpudlians of Irish origin living in the city. During the Irish emigrations of the 19th and 20th centuries, Liverpool was the principal port of embarkation for the United States, and many emigrants ended up settling in the city. Building began in 1928, although it wasn't actually completed until 1967. Around its cylindrical tower is a huge "tent," 200 feet in diameter, rising sharply to a funnel-shaped drum, 270 feet high, the whole structure looking like a huge lantern rising above the city. 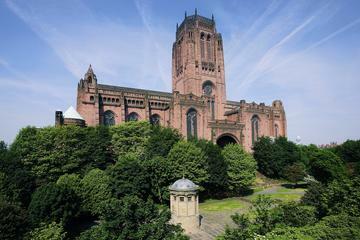 The Anglican Liverpool Cathedral on St. James's Mount was consecrated in 1978, although services were held there in the 1920s. Built of red sandstone with a copper roof, its 330-foot-high tower contains a carillon with 2,500 bells, the largest weighing in at four tons. Its 9,704-pipe Willis organ is one of the largest in the world. Also of interest is the Anglican Church of Our Lady and Saint Nicholas, a parish church that dates back to the mid-13th century. Opened in 2011, the Museum of Liverpool celebrates the city's unique geography, history, and culture using displays related to the port and its people. Collections include period costumes and decorative art, as well as objects representing the city's social and urban history, along with oral testimonies, archaeological material, and photos. The museum is also home to the famous Lion steam engine, built in 1838 and star of the film The Titfield Thunderbolt. While you're museum hopping, be sure to also visit the World Museum, with its fascinating account of how we humans have impacted the world we inhabit. This charming Edwardian mansion on the outskirts of Liverpool is well worth taking the time to explore. Highlights of a visit to Croxteth Hall include the chance to see countless rooms filled with furniture and character figures representing both the wealthy owners and their staff, as well as the majestic central staircase, popular as a setting for wedding photos. The Country Park is also worth exploring and home to a real working farm (kids love the chance to interact with its animals), a delightful Victorian Walled Garden, and a 500-acre nature park with many pleasant walking trails. On the banks of the Mersey and the Manchester Ship Canal, the National Waterways Museum includes numerous indoor displays, boat trips, historic Victorian-era buildings, and of course, the canal with its many wonderful locks. Designed by Thomas Telford under the direction of William Jessop, the docks at Ellesmere Port were still in use as late as the 1950s. Visitors can explore their unique workings as well as the docks and warehouses, a working forge, stables, and workers' cottages. Birkenhead lies on the west side of the Mersey and is linked to Liverpool by tunnels and the excellent Mersey Ferry service. Near the tunnel are the ruins of a 12th-century Benedictine abbey with a chapterhouse, crypt, and refectory. Birkenhead Park, the first publicly funded park in Britain, opened in 1847 and has three entrances with Gothic, Italianate, and Norman architecture, as well as two lakes and an ornate bridge. Also of interest is The Williamson Art Gallery and Museum with its first-rate collection of pictures and porcelain, together with material on the history of the town. Luxury Hotels: Within walking distance of the Albert Dock, Hotel Indigo Liverpool has a funky, fun decor and colorful rooms themed around the city's cotton trading heritage. iPod docking stations and rainfall showers are in every room. In the heart of the city, DoubleTree by Hilton Hotel Liverpool resides in a heritage-listed building and is popular for its large, stylish rooms; spa; and contemporary take on Corinthian architecture. The new, sleek and stylish Pullman Liverpool, at Kings Dock on the waterfront, is steps from the Echo Arena, and its chic rooms have wonderful views of the city or docks. Mid-Range Hotels: Named for a famous football manager, The Shankly Hotel has sumptuous, elegant rooms with double whirlpool tubs and Bluetooth. It sits steps from the World Museum and the Walker Art Gallery. For those who like the option of self catering, the apartment-style Staybridge Suites is in a fantastic location on Kings Dock, opposite Albert Dock and the Echo Arena. Breakfast is included in the rates. Once the headquarters for the White Star Shipping Line, 30 James Street, Home of the Titanic is less than ten minutes on foot from the Albert Dock and has a luxury spa and elegant Titanic-themed rooms, most with a double whirlpool tub. Budget Hotels: A walk from shops, restaurants, and the Albert Dock, the contemporary Ibis Styles Liverpool Centre Dale Street, with small, bright rooms, offers excellent value for money, as does the Travelodge Liverpool Central Exchange Street Hotel, within walking distance to the Albert Dock. In a fantastic city center location, The Nadler Liverpool has smart, sparkling clean rooms with kitchenettes.